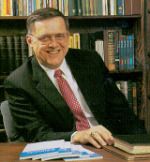 I gave little thought to the message of the gospel until after the near death of my wife, Barbara, and shocking death of my only son and youngest child on February 22, 1973. He lived only hours after being born. Though I was active in a liberal church, I knew I was lost and needed the Lord's salvation. In desperation, I cried to the Lord and He turned my eye to a grave marker inscribed with Psalm 23. The Lord became my Shepherd that very day. Within four years I moved to Greenville, SC, to study for the ministry. After six years I had completed both the undergraduate and masters programs, earning an M.A. in Theology in 1982. The following year, the Lord opened the door for a part-time pastoral staff position at the church I had been attending since moving to Greenville, Mount Calvary Baptist Church. In 1994, I left my mechanical engineering career to assume a full-time pastoral position in the same ministry. It is a daily delight to serve God in a ministry He has built, and I thank Him for His favor in placing me here for the greater portion of my Christian life.